I have yet to buy Girl Scout cookies this year…I’m not sure they’re for sale in our area yet. I’m sure we’ll eventually pick up a box (or five) but until then, I’m going to make a few different varieties of cookies and try different flavor combinations. These were really light and I loved the honeyed cream cheese filling. My husband wants me to make them again eliminating the honey and increasing the lemon zest. I think I’ll take him up on his suggestion and see how they turn out. I rolled the dough a little too big, but one cookie is the perfect size for a sweet treat. My next time, I’ll be rolling them smaller so they’re more bite-sized. Preheat oven to 375 degrees. Line two baking sheets with parchment paper and set aside. Place the 3 tablespoons of sugar into a small bowl. Roll the sugar cookie dough into 3/4 inch balls. Roll the dough balls into the sugar to coat. Place the balls on the prepared baking sheets, 1 inch apart. Bake for 8 to 10 minutes or just until the centers are set. Let cool on the baking sheet for 2 minutes. Transfer to a wire rack to completely cool. In a medium bowl, cream the cream cheese, honey and lemon zest with a handheld mixer until light and fluffy. 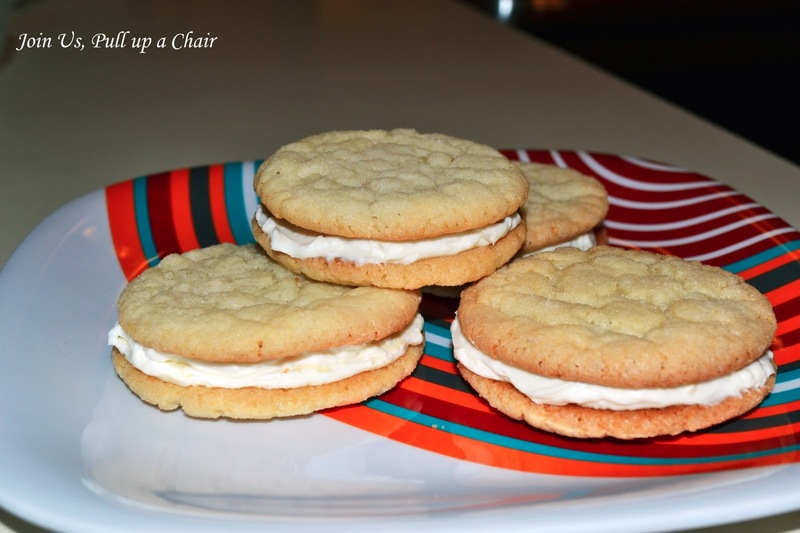 Spread the cream cheese filling generously on the bottom of a cookie. Top with another cookie and continue until all the filling and cookies have been used. Store the cookies in the refrigerator until ready to be served. Love that these are made with sugar cookie dough that is already made, makes for quick desserts.. Thanks for linking this up to Close to Home's V-day craft and recipe round up.